Bulldogs are hard to mistake with any other breed because of their fairly specific features. The furrowed brow, short pushed-in nose, loosehead skin, hanging chop, and rolling gaits are the features you will not see in any other dog’s breed. The easy-going personality makes it one of the best adapters among different breeds. The heavy-weight dog is a friendly and courageous animal. The well-muscled creature is a symbol of tenacity and courage. For decades, people used bulldogs to drive their cattle or to make them compete in bull battling. However, this violent image is changed now as bulldogs have become gentle companions of their owners. Upon receiving proper training, they can transform into good watchdogs. The high-quality food is the basic necessity of a bulldog to grow and stay active. The meat-based diet is essential as bulldog requires a good amount of proteins. You can feed it both home-prepared and commercially manufactured meals but take your veterinarian’s approval first is very important. Moreover, as the bulldog has a heavy structure, giving them excessive treats or high-fat food may cause obesity. Many veterinarians recommend giving bulldog dry and raw food. It must be nutritionally balanced and contain the right proportion of proteins. You can consult your canine expert to learn about the right choices of human food to give your bulldog. 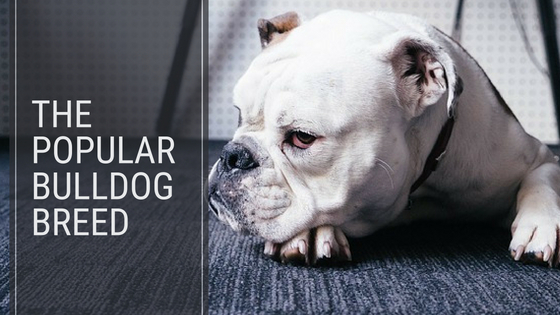 Although bulldogs have a smooth and fine coat, their hair still shed. This means brushing is essential for removing unwanted hair. It is also important for stimulating the skin cells to produce natural oils and distribute it evenly throughout the tender coat. Weekly brushing is ideal to keep your bull dog’s hair healthy and shiny. Always use high-quality brushes when it comes to grooming your pet. It will make grooming easy and keeps your dog’s fur glossy. Moreover, outgrown nails affect the dog’s movement and can lead to severe joint and bone-related injuries. Make sure that you trim your pet’s nails twice a week to avoid bone injuries. Occasional bathing is also important to keep each skin fold bacteria free. Exercise and Bulldogs are not synonymous terms. In other words, this breed is lazy and do not need much exercise. However, it does not mean that bulldogs should not exercise. 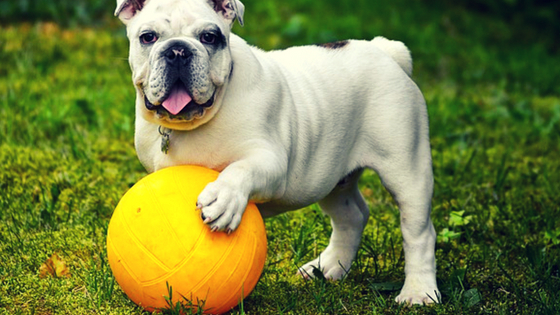 Engaging your dog in a healthy physical activity is substantially beneficial and increases the lifespan of your bulldog. Small exercises like a brisk walk, fetching, or ball chasing are perfect to keep your dog light, energetic and moving. Everyone wants his pet to become a better-behaved animal. However, it can be little more challenging when it comes to training a bulldog. The breed often exhibits bullheadedness trait, which makes it incredibly stubborn. However, if you start early training and expose it to different places, people, animals, and situations, it learns manners decently. You just have to be consistent with its personality to continue behavior training. Your vigilance matters a lot if you are a bulldog owner. You need to ensure that your dog does not get over-heated. If bulldog is left out in scorching sunlight, without any shed or water for long hours, it may increase the risk of heat stroke. Furthermore, if your bulldog gets overexcited or exposes to hard physical activities, it may cause breathing problems. In such cases, veterinarians and the AKC suggests keeping your dog cool by soaking it in icy water. Bull dogs are a rather large breed, which often makes them more difficult to travel with on airplanes. Taking that into consideration, they aren't our #1 suggestion for a companion animal. However, technically speaking, there are no laws preventing your bull dog from becoming an ESA Dog and you can easily do that online. Just take precautions when traveling and make sure not only you, but your dog and other people are comfortable at all times. In conclusion, this massive head animal has the ferocious appearance, but typically it has a loving disposition. The dense, hard-wrinkles are what set this dog apart from other breeds. It is trainable, and you can groom it without investing a lot of your time. Thus, Bulldogs are affectionate and loyal pets. The easy-going personality makes it one of the best adapters among different breeds.